As you can see I was in a reminiscing kind of mood. It got me thinking: What was my most memorable bookstore in Laos. First bookstore I ever visited in Laos is of course my memorable one - and it was the Lao State Bookstore/Bookshop aka Lao State Publishing and Books Distribution House. Although there's quite a number of places to choose from to buy books in Vientiane these days, this place still remains as one of my favorite bookstores to visit in the city because of the variety and decent prices. It feels like it's been around for ages - in fact it's been around for 29 years! 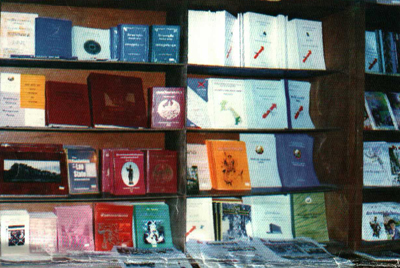 It has a lot of state published books but also tons of other books published by other publishers too. I usually aim for the more educational, historical and cultural reference books personally. 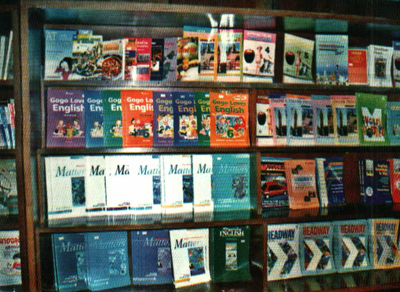 Also, many of the books used in Lao schools are also sold here. For example, I bought a whole bunch of Lao language learning books from here. I was able to get most of the different levels that are taught. They also sell newspapers, and some other random items like music CDs and postcards (the inventory varies and changes). 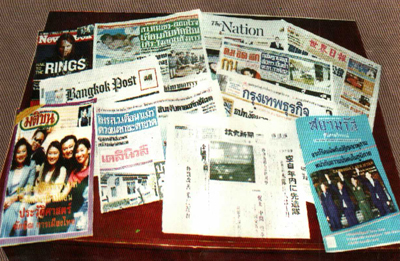 Most of the books are in Lao but they also have English and Thai. Generally has good prices but some items can be a bit pricey. Here's some old pics of the interior of the store I got from a calendar poster that I got from the store. Do you have a favorite bookstore in Laos? Share your thoughts or recommendations below in the comments section.